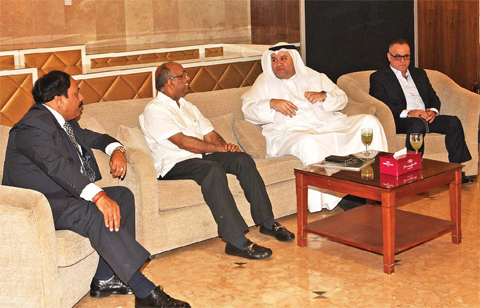 KUWAIT: Kuwait Times in association with Aashiaana, a leading property portal in Kuwait held the 2nd day of ‘India Property Mela 2015’ exhibition at the Crowne Plaza Hotel. The exhibition allowed visitors to meet and interact with some of the top Indian builders and real-estate developers, giving them the singular opportunity to gain first-hand information on ongoing and upcoming real estate projects across India. Hundreds of projects, ranging from affordable apartments to luxury villas from some of India’s top developers including; Lodha, Kanakia, Mahindra Lifespaces, Hubtown, Vaishnavi, Propshell, KoltePatil, Nahar’s and Supertech are on offer at the Property Mela. Developers are highlighting their properties in cities such as Mumbai, Navi Mumbai, Pune, Thane, Nagpur, Ahmedabad, Gurgaon, Noida, Goa, Hyderabad, Bangalore and Chennai, among other places. Yashwardhan Jain, the Deputy Manager of Lodha, told Kuwait times that Lodha group has been participating in such exhibitions in Kuwait and other countries for 35 years, to offer the best property with India’s No 1 real estate developer. The Lodha Group has several landmark developments to its credit including World One – the world’s tallest residential tower and Palava City – the largest private development in the world. The group has brought some of the top global names including Armani/Casa, Trump, Philip Starck, Jade Jagger, Greg Norman and Pei Cobb Freed to India. The Group has recorded the biggest land deal in India – buying a plot for INR 4,053 Cr from the Mumbai Metropolitan Region Development Authority (MMRDA) in 2010, where it is developing New Cuffe Parade. Lodha is offering reasonable prices for world-class AC residences – starting from $64.000. It also offers an easy buy special. On his part, the Senior Manager of Kanakia, Sanju Cherian said that Kanakia Group has developed and successfully delivered over 13 Million Sq. Ft of commercial, residential, entertainment, education and industrial spaces. He add that as an NRI, there couldn’t be a better time to invest in India. Kanakia is not only in India but also in Paris – the beautiful city. “Kanakia – with its penchant for ‘Perfection’ in all it does has earned a distinct reputation as one of India’s premium developer and is rated as one of the top 10 Real Estate development brands with over 28 years of experience in the real estate domain,” he said. With real-estate investment once again on the rise, the Indian Property Mela is an ideal venue for Non-Resident Indians (NRI) in the country to explore the potential of buying properties or making investments in this highly rewarding sector. However, before venturing into any real-estate investment, there are few things that NRIs should be aware of. The buyer or investor should understand and outline the basic objective of buying the property. This will give them leverage provisions in the Indian Foreign Exchange Management Act and in the Income-tax Act to their benefit. According to this Act, an NRI enjoy almost all the privileges which are enjoyed by a resident Indian with reference to purchase of immovable property in India. This Act states that an Indian citizen who resides outside India is permitted to acquire any immovable property in India, other than agricultural/plantation property or a farm house. NRI’s can invest in a residential property for their use. This property can be in the form of ownership flat or a piece of land. In both situations, recent liberalized rules by the Reserve Bank of India, taking a loan to buy the property could prove to be the best strategy. NRIs can also invest in a residential or commercial property with the objective of receiving a regular flow of rental income. The provisions of taxing rental income are simple, easy and investor-friendly. Broadly speaking, from the rental income derived by a NRI, deductions are available in respect of actual payment of house tax. These deductions are permissible irrespective of whether or not you spend on repairs. Another important feature of taxation relates to complete deduction without any limit to interest paid by the NRI for purchase of property which is given on rent. That is, the entire interest payment for purchase of property which is given on rent is allowed as a deduction from the rental income. It is strongly recommended that NRIs do not sell their property at least within three years of purchase. In case the property is sold before the completion of three years, it is liable to tax and is to be added with other income of the NRI. If sold later, then this clause does not apply. Also, within the provisions of the Foreign Exchange Management Act, it is possible for a Non-Resident Indian to repatriate the rental income received from investment. Whenever a NRI invests in an immovable property; it is advised to obtain a Permanent Account Number (PAN) Card so that if the NRI has certain income by way of rental income from India, then it is easy for him to make tax compliances. – Reverse Mortgage Benefit for NRIs: The concept of reverse mortgage is very popular in India. Today’s senior citizens in particular are taking advantage of reverse mortgage in respect of the real estate owned by them in India. The amount taken from the bank consequent to reverse mortgage is not added to the income of a NRI and is not taxable. Thus, in old age this could prove to be beneficial. Real estate investment might be a difficult decision to make; however, if made wisely, it could prove to be a highly rewarding one. An ideal opportunity to explore the potential of this lucrative sector is to visit the ongoing Indian Property Mela 2015.